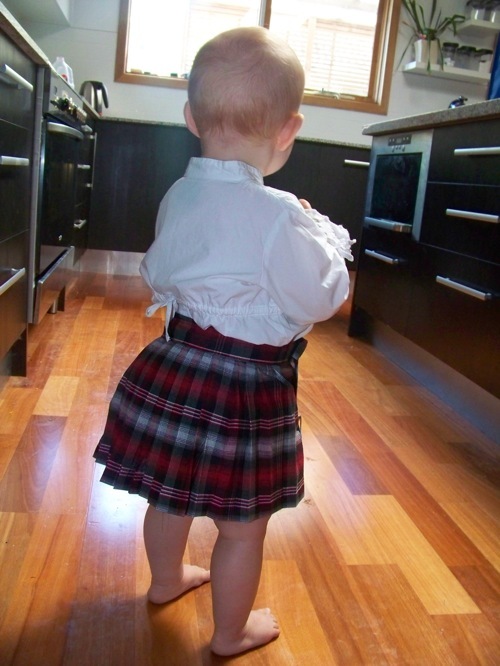 Kilts for babies make beautiful kilt pictures. Kilts for babies are becoming very popular with mums and dads around the world. So much so that there are now several companies online that specialize in baby kilts, and their accessories. If you would like to buy a kilt for your baby you can do so by visiting some of these companies. But not everyone wants to buy a kilt for their baby. In fact the inspiration for this page comes from a visitor to the web site named Shelley, who after reading the page on how to make a kilt, decided to scale down the instructions and make one for her daughter Abigail. Now Shelley lives in Australia, and because she wanted the kilt for Abigail for a party, she decided to use cotton that she found in her local fabric shop, rather than wool. It is true that for many people, making a kilt would seem to difficult or complicated, but Shelley told me that having followed the instructions, she was very successful. After she contacted me through the contact us page on the site, I wrote back to congratulate her, and asked if she would care to send me a photo or two, as kilt pictures are the backbone of the web site. She said she would take some as soon as Abigail woke up and email them to me, and as you can see below, thirteen month old Abigail was very happy to pose in her new kilt. So much so that she even showed the pleats off nicely by turning around for the camera. So if you are thinking about a kilt for your baby, perhaps you will be inspired by the wonderful job Shelley did, and decide to make one yourself rather than buying one. And if that is the case, you too might decide to send me some photos that I can feature on the site.